Cezars International K.K. and its family of services is very much connected to the expat community in Japan. So we know how difficult it can be, at times, living abroad. Cezars’ flagship, Shooters Sports Bar & Grill in Nagoya knows this all too well and, for several years, has been offering a seasonal service to provide complete, fully-cooked roast turkey dinners for take-home at Thanksgiving and Christmas. 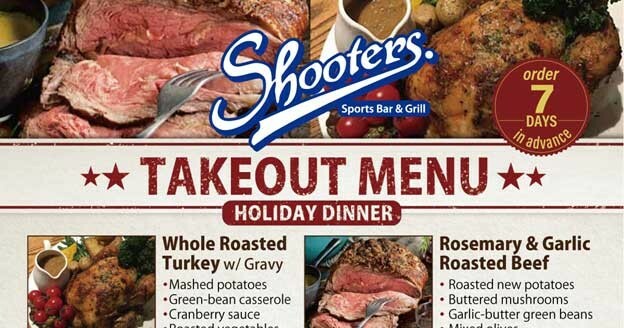 Well now, Shooters has expanded the menu to include other roast meats, as well as some BBQ and party favorites. Best of all, the service is available all-year-’round! So expats and locals alike can enjoy complete roasts dinners, with family and friends, any season of the year. It is really easy to browse, order, and pay on-line. Great for family dinners, and your office gatherings as well. You do the hosting, let Shooters do the roasting!